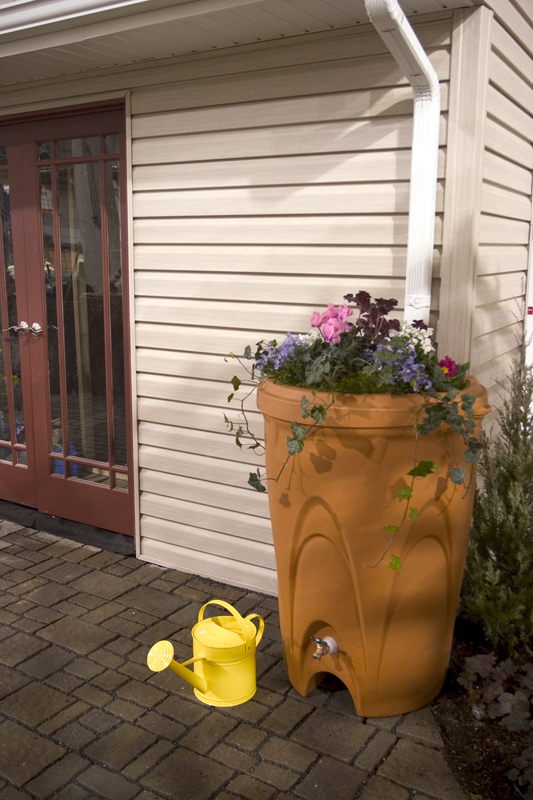 For thousands of years, stormwater has been viewed as something that needs to be carried away from inhabited areas as quickly as possible to prevent potential hazards such as flooding. While most ancient drainage systems handled both waste and stormwater, the first known drainage system built to handle just stormwater was constructed by the Indus civilization which thrived in the Indus River Valley from about 2300 to 1300 BC. Fast forward to modern times. 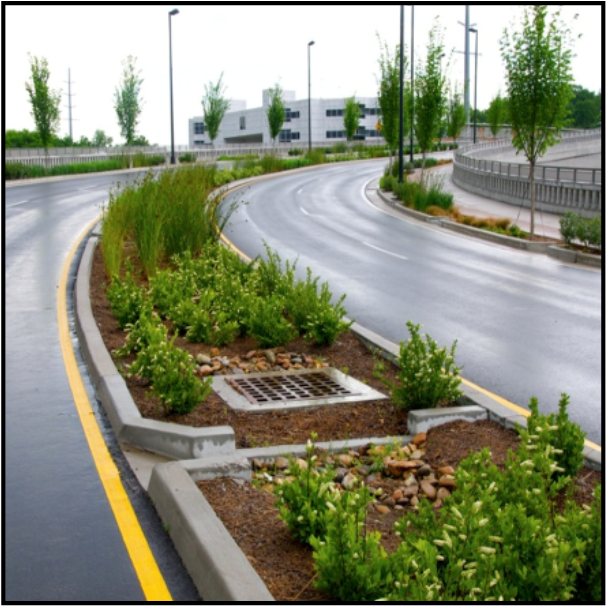 While modern stormwater drainage systems are effective in removing stormwater from paved areas and carrying this untreated water directly to local waterways, there are some unintended consequences. Many US communities have experienced a significant increase in development which has placed a disproportionate burden on existing infrastructure. This growth also means that the amount of impervious surfaces such as paved areas and roofs have increased as well, disrupting one of the natural functions of land which is to allow stormwater to soak into the ground. This important function recharges groundwater and replenishes streams during dry periods. This reduction in opportunities for stormwater to infiltrate has resulted in a dramatic increase in the amount and velocity of runoff traveling through the storm drainage system and entering rivers, creeks, lakes, streams and oceans. Since anything on the ground (oil, grease, yard chemicals, pet waste, litter, etc.) can be picked up by stormwater and washed into the stormwater drainage system, stormwater pollution has become the number one pollutant in our nation’s waterways. Many older communities also are experiencing costly issues with deteriorating and insufficient infrastructure to manage the increasing stormwater demands placed upon it. These economic realities as well as federal water quality guidelines have encouraged them to rethink the old model of getting rid of stormwater as quickly as possible and explore some new approaches. And faced with changing weather patterns which continue to bring more severe storms, heat, floods, and drought, states, regions, and communities are looking for ways to more efficiently manage stormwater and utilize it as a resource rather than a liability. soak into vegetated areas along the roads; replacing traditional pavement with permeable options so that stormwater can soak through and into the ground rather than run off; creating rain gardens and vegetated areas to slow down, filter, and infiltrate stormwater; planting trees to absorb stormwater, improve air quality, and reduce heat islands in urban areas; installing cisterns and rain barrels to capture rainwater flowing off structures so that it can be stored and used for irrigation at a later time; planting green roofs on structures to reduce the amount of stormwater runoff leaving the roofs as well as reduce heating and cooling costs. While it is difficult to quantify improvements that green infrastructure contributes to community quality of life, studies have shown that there is a definite positive economic value to implementing green infrastructure practices.  Create a rain garden in a low area of your yard and install water loving native plants like aster, black eyed Susan, and coneflower. This is a relatively inexpensive yet highly efficient feature which can absorb up to 40% more rain water than turfgrass alone.  Plant a tree. One large tree can absorb up to 100 gallons of water per day, reduce home heating and cooling costs, and remove 13 pounds of carbon from the air each year.  Allow areas of your yard to remain natural, and use pavers or gravel for walkways and driveways. 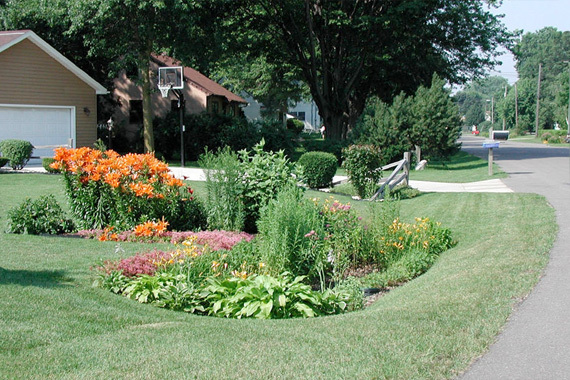 All of these options serve to slow the flow of stormwater, spread it out, and allow it to soak into the ground rather than leaving your property.  Add native plants to your landscape to attract birds and other wildlife. Not only will these areas be more efficient at absorbing stormwater; they also will be more resilient to pests, disease and drought, and the birds you attract will provide free bug control while reducing the need for pesticides and other yard chemicals.